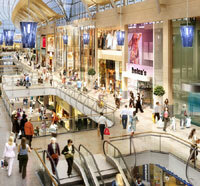 St David’s 2 is a prestigious new shopping centre in the centre of Cardiff. It builds on the existing St David’s shopping centre that houses Marks and Spencer, Debenhams and Boots. With the opening of the new shopping centre in November 2009 it is now possible to shop totally under cover from Cardiff’s main shopping street Queen St. right through to the Cardiff Marriott Hotel on Mill Lane.